Not only is the Family Computer an awesome gaming system, it’s also one of the most reliable, versatile and widespread computing platforms in the world! A custom 6502 CPU with integrated audio generation and joystick interface, a Picture Processing Unit (PPU) chip with full sprite support, smooth scrolling, a rich color palette and the possibility for cartridges to expand the system’s capabilities through extra hardware made for a very advanced, reliable and an excellent hardware design. No wonder why it’s one of the most cloned systems ever! The Famicom core design is present in more places than you can possibly imagine. The first Famicom clones were simply complete reproductions of the CPU and PPU chips in a compatible board. Later on, advances in semiconductor technology allowed to condense the CPU, PPU, RAM and the rest of the logic chips of the system into one small sillicon die, etched directly into the board and covered with a black epoxy glob, further reducing manufacturing costs (this is the infamous ‘NES on a chip’ or NOAC). Famicom clones were produced in massive quantities at a minimal cost. From 1983 to 2003, the Famicom design was protected by patent laws, making Famicom clones illegal, but this didn’t stop their massification around the world, bringing the joys of Famicom gaming to places it has never been officially, and providing an inexpensive gaming alternative for budget-concerned people. In 2003, Nintendo’s patents on the Famicom design expired, making the production of Famicom clones completely legal. This produced a resurgence of the Famicom clone market. Legal clones appeared, like the Generation NEX. Cheap clones disguised as various legitimate video game systems flooded the market. The inexpensive, reliable and very capable Family Computer design found its way into other devices, like dance mats, portable systems, “Plug & Play” TV game joysticks, even the Atari Flashback 1.0, a Plug & Play unit with built-in classic Atari 2600 games used a NOAC at its core! Atari 2600 games running on a Famicom clone! As of 2009, the production of cloned Famicom systems and games is still going strong. It’s an incredible feat for a 26-year-old design! Get your soldering iron and multimeter ready! 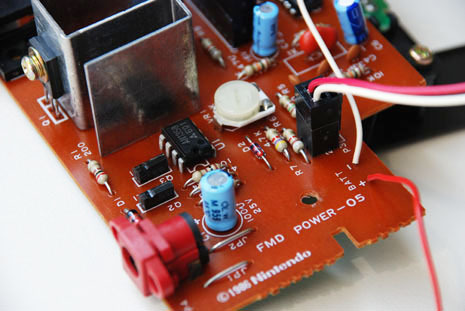 In this section you’ll learn how to get the most out of your Famicom system, games and accessories, and you’ll be able to solve common problems and annoyances that usually affect our beloved systems. Workshop tech, mods and other information.